Nintendo sent out a press release this morning seeking new challengers for a Super Smash Bros. tournament at San Diego Comic-Con. This tourney will feature the Nintendo 3DS version of the game, unlike the Wii U version challengers squared off on at E3. For those who want to watch the tournament while far away from San Diego? Nintendo will put the livestream up on Twitch once again. Will you be watching? Or, do you have what it takes (geographically) to enter the tournament on your own? REDMOND, Wash. — Nintendo will be hosting its first-ever tournament for the Super Smash Bros. for Nintendo 3DS game at San Diego Comic-Con on July 25. Fans are invited to come to the Nintendo Gaming Lounge at the Marriott Marquis & Marina located at 333 W. Harbor Drive (adjacent to the San Diego Convention Center) for a chance to participate. Starting at noon, there will be a preliminary round in which groups of four competitors battle it out, with the winner advancing. During the finals, players will duke it out one-on-one to determine the top smasher. Tournament slots are limited, and fans will be able to sign up the day of the event on a first-come, first-served basis. For fans not able to attend San Diego Comic-Con, tournament action will be streamed live on Nintendo’s Twitch channel at http://www.twitch.tv/Nintendo. Additional Nintendo Gaming Lounge activities will be announced in the future. 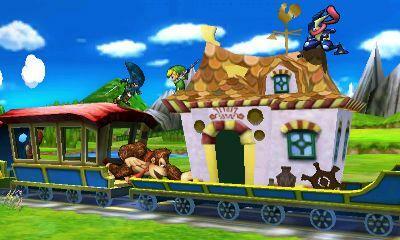 Super Smash Bros. for Nintendo 3DS launches on Oct. 3. Super Smash Bros. for Wii U launches this holiday season. For more information about Super Smash Bros., visithttp://www.smashbros.com/us/. For more information about Nintendo 3DS, visit http://www.nintendo.com/3ds. For more information about Wii U, visit http://www.nintendo.com/wiiu.